Middle eastern countries and Australia are NOT affected, while a portion of southern Japan has been IP blocked again. Discussion goes in this topic, don't make any more. Wait... Japanese MapleStory... Middle eastern countries and Australia are NOT affected while Southern Japan is... Isn't that pretty odd...? That's why it's a glitch. So I heard that if you click eggs you become stronger. So, i could sign up and d'l the cilent and change my language pack and play score. Anyway, I really think that they should fix this IP ban. They're blocking their own country's people from playing! Oh sweet. Now to get my korean freind over to translate the main page for me. Dedicated to the eradications of wankers since 2009. Is New Zealand banned by any chance? Currently playing Warhawk on the PS3! You'd think it'd be fixed asap if a portion of Southern Japan got blocked. Maybe quicker than last time? I guess I got lucky again since I live in Australia... and I'm so close to getting hermit as well. 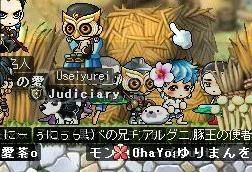 Part of S.Japan got banned last time and it took 2 months for nexon to catch it. Gameguard is what controls the updates, and the GGscan that was added is causing the block.